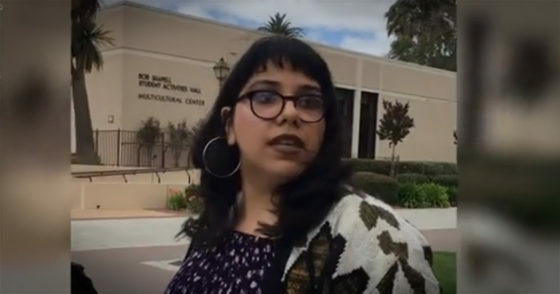 Students at Santa Clara University in California recently held an anti-socialism event, and one student apparently just couldn’t handle it. “The school’s Turning Point USA chapter hosted the May 31 event to honor the victims of 20th century socialist and communist regimes by displaying 1,000 red flags on campus, each representing 94,360 lives”, reports Campus Reform. Incensed by the display, an outraged individual approached the TPUSA students as they were tabling nearby, ripping up their anti-socialist posters and calling them “a bunch of f***ing Trump supporters,” club members told Campus Reform. During a portion of the altercation that was captured on video, the student was seen standing close to the student organizers and ripping one of the event posters that was taped to their table. The activist also vocally defended some socialist governments, and criticized capitalist exploitation of poor nations. According to the video footage and eyewitness testimony, none of the TPUSA chapter members physically confronted the irate student. Instead, they calmly attempted to have a conversation with her before giving up and asking her to leave.